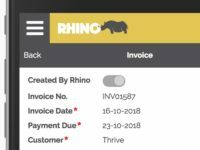 The Rhino Small Business App lets you see at a glance all the information for a contact including Estimates, Jobs, Invoices, Notes, Appointments and Documents in one single fully integrated business solution. Your information is accessible across all devices including your phone, tablet or computer. Your business data is stored and shared in the Rhino Cloud which means that your employees are accessing and updating the same information. We do not store any information on your local device which means that your data is safe even if you lose your phone! 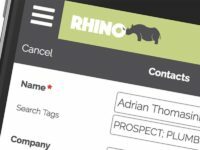 The Rhino Small Business App is fully GDPR compliant. 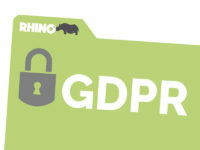 To comply with the GDPR regulation to store personal contact information securely, address, telephone and email data is encrypted in the Rhino Database. In addition, all Data Communications to and from your device to the Rhino Cloud is also encrypted. 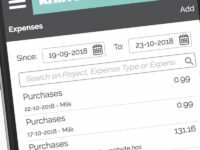 To comply with the GDPR regulation which grants anyone the right to request that you disclose what information you are storing about them, we have embedded this process into the Rhino Small Business App. You simply click on the ‘Data Request’ button and it sends an email to the contact that contains a PDF report summarising what data you are storing against them and it keeps a record of this as proof that you complied with their request. The email sent to the customer also contains a link that automates the process to lock their account should they wish to invoke another key requirement of this process which is the ‘Right to be Forgotten’. 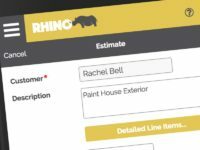 Load the contacts that are currently stored in Rhino straight into the Rhino Small Business App. You can also load your contact information from a spreadsheet. The Rhino Small Business App also integrates with your Telephone, Email and Maps Apps on your local device. RHINO can transform how you do business, giving you everything you need at your fingertips. Take the opportunity to see for yourself. Try our free trial.